Asus, Fujitsu, MSI, Samsung and Motion aren't the only PC makers with Windows slates at CES, although they're the ones you'll see shipping first (in fact you can order the Asus Eee Slate EP121 this month). There are companies you may not have heard of doing Windows slates (like Viliv and Netbook). And then there are some tablet PC makers who are being a bit more cautious. Toshiba has its Windows 7 slate rotating in a case on its stand, carefully labelled as a technology demonstration. Whatever product that turns into will ship in the US only initially; Toshiba Europe will have a Windows tablet "as soon as possible when we understand the European requirements" Toshiba president Alan Thompson told us. The other Windows tablets we've seen at CES haven't been on the show floor as products that are ready to ship; they're prototypes of products we won't see for a while and some are tucked away in private meeting rooms but they're evidence that not all the PC manufacturers are going to wait for the slate improvements expected in Windows 8. Lenovo is bringing its hybrid LePad Android/Windows combo tablet/notebook out in China first and that might also be the first place it sells the prototype 10.1-inch Windows 7 tablet we caught sight of. Lenovo tells us it has plans to bring this Oak Trail Intel Atom tablet out in 2011 and didn't say any more, but we learned a little more from looking at the system. We didn't get an official name, but the PC name in Windows is the LT10. 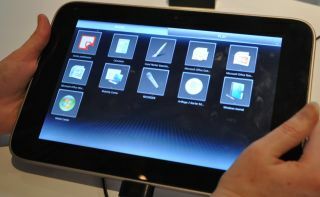 The prototype has a 1.5GHz processor, 2GB of RAM, a 32GB SSD plus USB and SD ports tucked away behind a hinged flap and a dock connector on the bottom edge. It has a 1280 x 800 screen with combined finger touch and an active digitiser for the pen. Both gave us a nice smooth touch experience. The custom Lenovo interface (divided into Work and Play) has big, finger-friendly icons and it's much more responsive than the convertible IdeaPad S10 netbooks we've tried. Windows was reporting battery life of around six hours with Wi-Fi on (less than the eight hours Motion is promising from its similar slate). Lenovo is also planning some nifty accessories, like a desk stand for the pen that holds it upright and ready to grab and a keyboard with a recess for the slate to dock into, as well as a simple dock that's a stand and charging cradle together. Acer has been getting attention for the dual-screen Iconia notebook Microsoft showed off in its CES keynote, but we also found an Iconia slate in the private Microsoft PC showcase. It's another 10.1-inch screen with 2GB of RAM and a 32GB SSD, but this time running on an AMD CPU. It's a nice sleek slate running Windows 7 Home Premium and weighing 2.2lb but what makes it stand out is the excellent detachable keyboard. This connects to the standard USB port placed on the bottom edge (where many manufacturers are putting a custom dock connector) with two lugs to keep it in place and a flap at the back to help you fold it down when you want to close the laptop you've just converted it into. When we enthused about being able to rip off the keyboard and leave it at home to lighten the load, Microsoft told us about another tablet coming from Portland-based CTL (a small PC maker with the advantage of being geographically close to Intel, who came out with the $499 2go Pad SL10 for the education market last year). Their Oak Trail Atom prototype has a detachable keyboard with an extra battery in, which will double battery life – from ten hours up to 20.